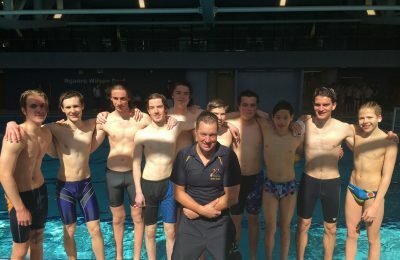 On Saturday 8 September, the Intermediate Water Polo Team played their final game of the season against Camberwell Gold at the Ngaere Wilson Pool at Camberwell Grammar School. The game started well with a goal to Harry Fothergill to level the scores at quarter time. After a strong second quarter with two goals from James Key and one from Charlie Stute and none in reply, the team was well-placed for the second half. The boys worked well together to get away from the opposition and eventually ran out winners 7 – 3. The team finished the season in 2nd place after Melbourne High School, having only lost one game which is one position higher than last year. Despite not being able to secure the pool to train, the boys worked really well as a team developing their skills. The team was made up of the following students in Years 8 to 10: Vincent Konynenburg (goalie), Maximillian Shallvey, James Key, Charlie Stute, Josh Hulett, Ciaran Weir, Harry Fothergill, Harry Rooney, Angus Bunker-Smith, Luke Cormack, Patrick Zwarts, Riley O’Connell, Evan Chee. Thanks so much to the boys and their parents for giving up their Saturday mornings to represent the school in this competition and particular thanks to Patti, Vin’s mum who supplied an energy boost at the breaks. Thanks also to Mr Shane Cotter and Mr Gavin Kellar for arranging the competition and liaising with the other schools. This is the third year Whitefriars has participated in this invitational competition and it is pleasing to see the improvement each year. We hope to have more students participate next year and look at the possibility of entering both an intermediate and senior team.